As a native Californian, I tend to appreciate kitchens that offer both high-quality, beautifully presented cuisine and a relatively casual ambiance. 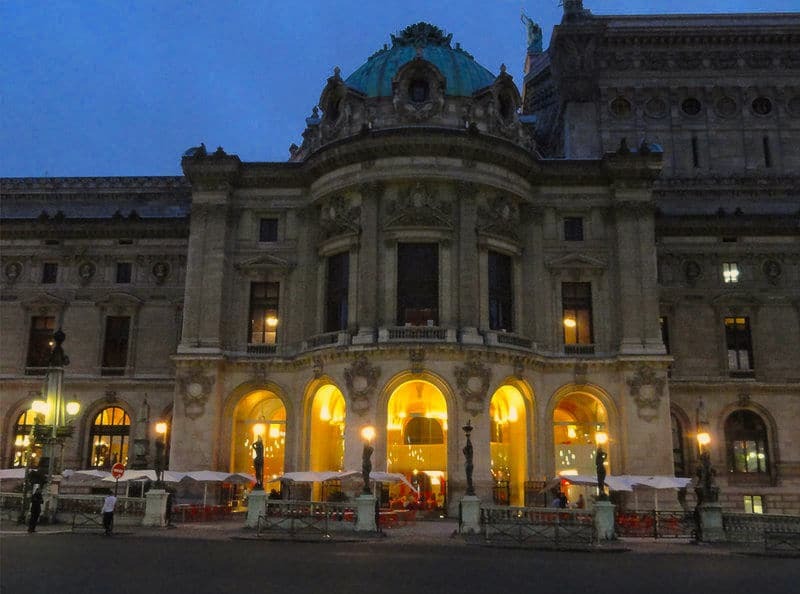 I was expecting full pomp and circumstance at the Palais Garnier’s onsite restaurant, L’Opéra, since the palace and seat of France’s national ballet is a posh spot, to understate the matter. However, lunching outside on the restaurant’s large terrace, I was pleasantly surprised to find that, at least during midday, there’s little stiffness or starchy formality to be observed here. Instead, thoughtfully prepared seasonal dishes were served amid a flurry of warm chatter, and patrons were dressed in everything from jeans to suits, making for a relaxing and pleasant meal. 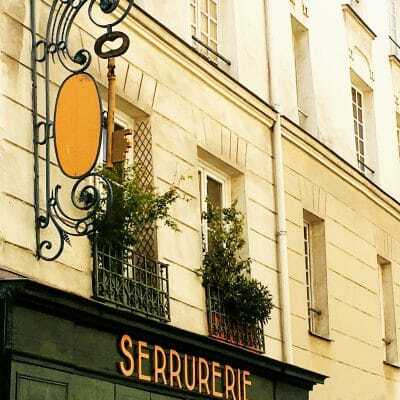 Whether you see a show at the Opera before or after a meal here or stop in for a light bite in between browsing the aisles at the nearby, grand old department stores Galeries Lafayette and Printemps, this is a place I certainly recommend. Reservations: By telephone or book online here. 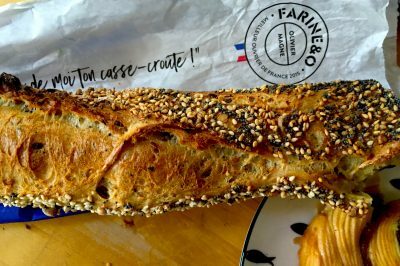 Cuisine: Traditional French/fusion, with a focus on seasonal local vegetables, high-quality meats, and Asian-inspired dishes. Menu options: Breakfast served from 8:00 am to 11:00 am. There’s a daily fixed-price menu (lunch from 12pm-3pm and dinner from 6pm-7pm); a la carte options are exclusively served outside of these hours. A bar menu for light meals is offered outside of lunch and dinner hours. Dress code: None enforced: casual to business casual. I observed diners at lunch in jeans; others were more formally dressed. Avoid jeans and t-shirts at dinner. 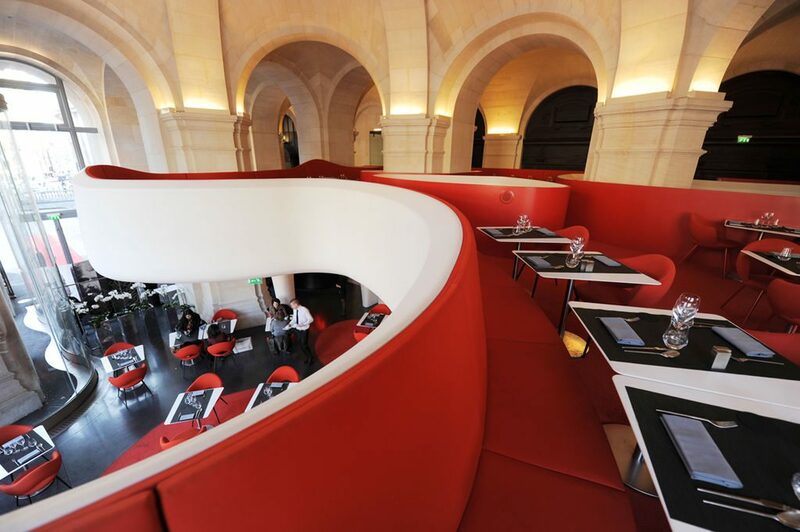 Built into the eastern wing of the sumptuous Palais Garnier, L’Opera restaurant’s design– from French architect Odile Decq– is decidedly contemporary, featuring bright red and white and clearly alluding to the drama of performance. What might have otherwise been a rather stark, cold affair is tempered, though, by the opulent statuary and sculpted details of the operahouse itself. It’s a successful yoking of old and new, not unlike the glass pyramid that now graces the main courtyard of the Palais du Louvre. 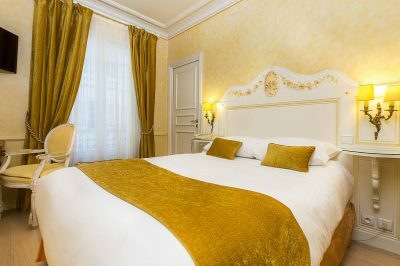 Outside on the large covered terrace, you’re relatively sheltered from the bustling boulevard, but there’s also a sense that you’re steeped in the action and excitement of the city. A separate bar area outside lets you relax (and people-watch) on large, comfy divans. The fixed-price lunch menu (currently at 37 Euros, but prices may change at any time) includes a starter and main course or starter and dessert, plus a bottle of mineral water. But since my lunch companion and I wanted to get a more representative sense of the menu, we decided to order a la carte instead. Lunch began with two summery, cold soups, one traditional and the other eclectic. 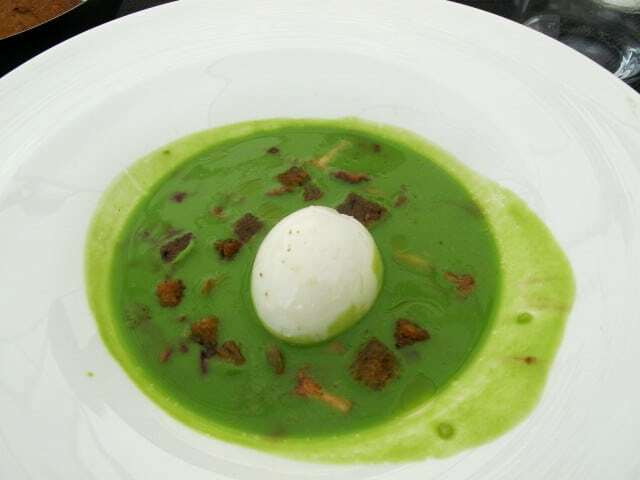 I ordered a creamy pea soup with poached egg, wonderfully fragrant girolle mushrooms, and shavings of yuzu (an especially tart Japanese variety of lime). My companion ordered gazpacho with green and roasted tomatoes and cider vinegar. We agreed that both were impressive for their fresh, simple but striking flavors, with each easy to distinguish. I was pleasantly surprised by the citrus note, which made a dish that I associate with winter (pea soup) seem entirely summery. Moving on to the main course, I was presented with a delicate portion of king-crab risotto, seasoned with marjoram, basil and parmesan. It was just creamy enough, while retaining the delicate flavors and freshness of the crab and basil. The portion was small enough that I could still comfortably look forward to dessert. 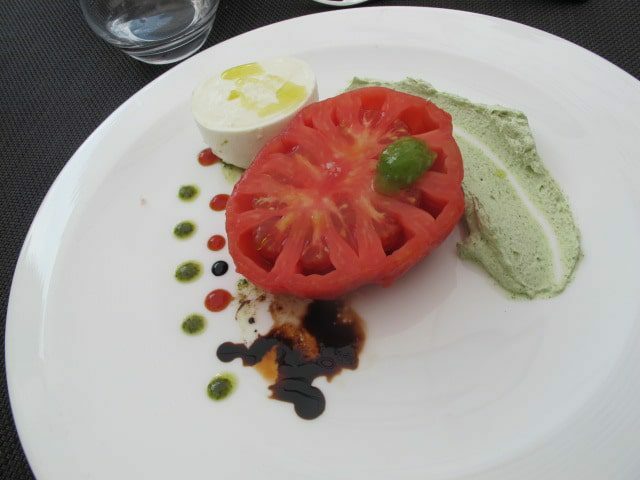 The other dish, one of the vegetarian entrees, stood in as a main course, and featured a remarkably fresh-tasting block of bufala mozzarella, beefheart tomato, accompanied with pesto and caramelized tomato. We were taken aback by the pure flavors of this simple dish, ideal for a light summer meal. Clearly, top-quality ingredients were a priority at L’Opéra: this is sadly not the case for numerous restaurants in the capital, which rest on the laurels of the city’s reputation and all too often use frozen or wilted vegetables. Dessert was a café gourmand— a platter comprising dainty, visually pleasing portions of two desserts accompanied by an espresso. 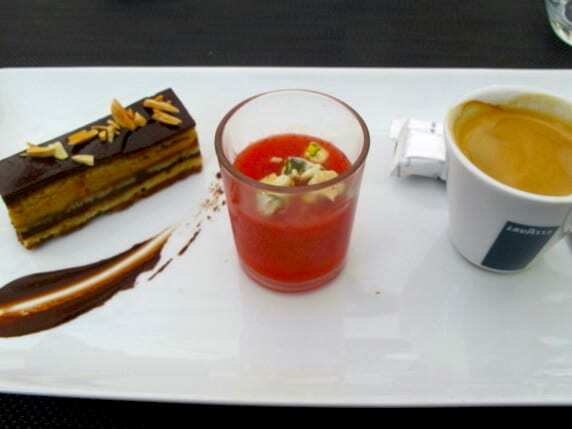 I thoroughly enjoyed the opera– a chocolate-based pastry with layers of ganache and sponge cake– and the cold strawberry soup to finish off my summery meal. My companion, ever the chocolate devotee, concluded with an ultragooey moelleux au chocolat (fondant cake) accompanied by a small amount of dark chocolate cream and orange-chocolate “emulsion”. 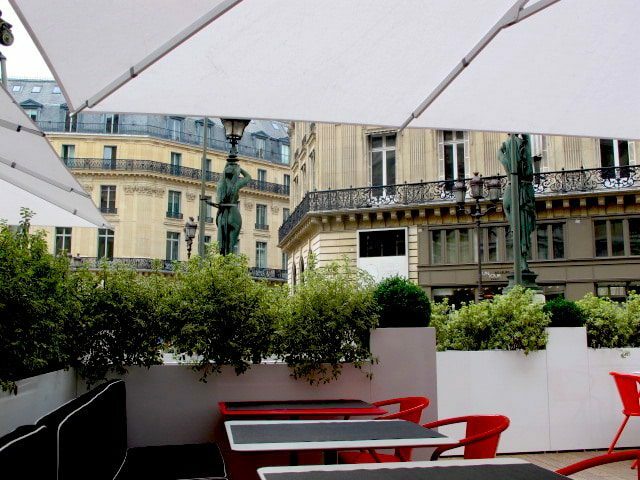 Since writing this review, which was initially published on my former site About.com Paris Travel, the Opéra Restaurant has brought a new chef on board. Chef Chihiro Yamazaki has redesigned the menu, but maintained the restaurant’s focus on fresh local produce and unexpected flavors. Strong Japanese influences mingle with French in what appears to be an inspirational and interesting set of dishes. Examples featured on the current menu include pumpkin soup with earl grey tea, goat cheese cream and gingerbread; seabream sashimi with exotic fruits and passionfruit sauce; Vegan pot au feu with Japanese vegetables; duck breast with duet of beets, roasted pears, sweet wine and honey, and miso-marinated black cod with saffroned kohirabi and daikon. 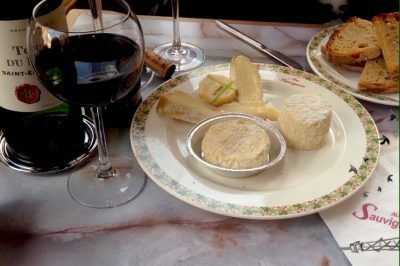 This is a good choice for quality, un-fussy dining in the Opera or Grands Boulevards neighborhood. While the menu is fairly simple, I was impressed by the emphasis on top-notch ingredients and thoughtful presentation. I also appreciated, as always, that the vegetarian options extended well beyond hot goat’s cheese salads and raw vegetable platters.